The Austen 49 inch vanity combo is simple yet stunning. The Austen Collection features a minimalist design that pops with colour thanks to the refined Twilight Gray finish with matte gold trim and hardware. 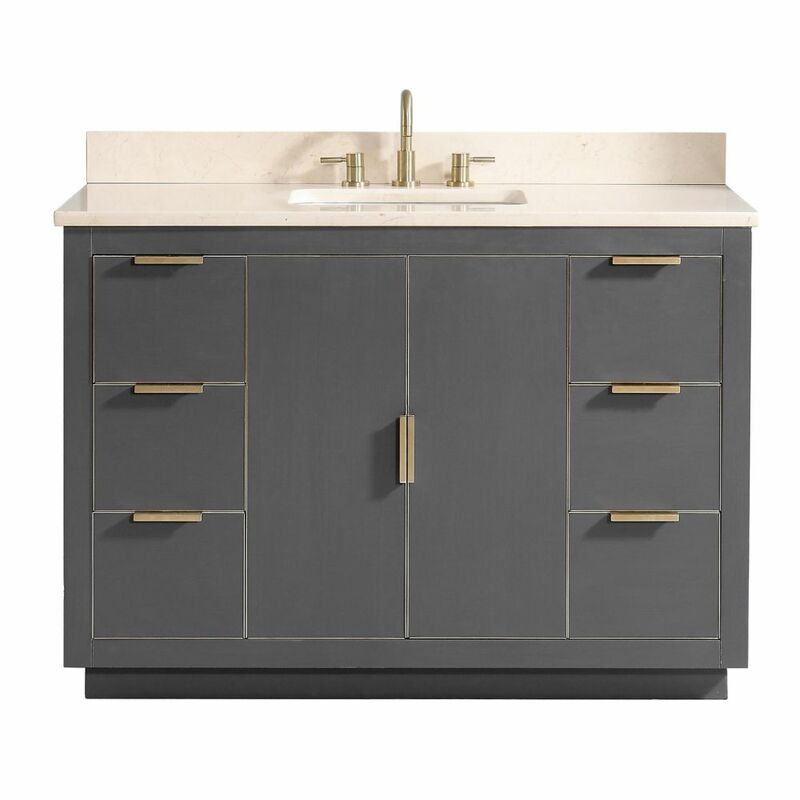 The vanity combo features a solid wood birch frame, plywood drawer boxes, dovetail joints, a toe kick for convenience, soft-close glides and hinges, crema marfil marble top and rectangular undermount sink. Complete the look with matching mirror, mirror cabinet, and linen tower. A perfect choice for the modern bathroom, Austen feels at home in multiple design settings. This vanity has both an all-around look and a traditional style. Its beige tan marble counter and white solid wood base are very easy on the eyes. Put a nice touch on your bathroom's look with this vanity set from Avanity. Austen 49 inch Vanity Combo in Twilight Gray w/ Gold Trim with Crema Marfil Marble Top The Austen 49 inch vanity combo is simple yet stunning. The Austen Collection features a minimalist design that pops with colour thanks to the refined Twilight Gray finish with matte gold trim and hardware. The vanity combo features a solid wood birch frame, plywood drawer boxes, dovetail joints, a toe kick for convenience, soft-close glides and hinges, crema marfil marble top and rectangular undermount sink. Complete the look with matching mirror, mirror cabinet, and linen tower. A perfect choice for the modern bathroom, Austen feels at home in multiple design settings.